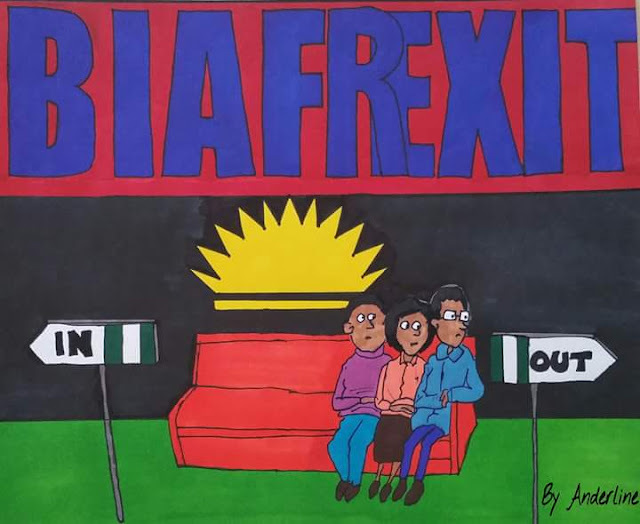 BE NOT DECEIVED: BIAFREXIT IS NO DIFFERENT FROM BREXIT: BIAFRA MUST GO! I laugh as I read about the fear that has envelopes the political, and affluent personalities in Nigeria when they speak about our BIAFREXIT. We have really come far. When men like Senator Ben Bruce, Reuben Abati, Jerry Gana, etc begin to show awareness, concern and give opinions about Biafra and Director Nnamdi Kanu, it is a good and positive sign. We are making progress and there is no one or anything stopping us. As the hands of the clock, we are quickly ticking with the tide, and prophecy that Biafra is finally arrived. We may have suffered set backs due to the draculas and vampires, which waylaid us and we lost our precious ones as they paid supreme prizes but even in death, their blood has watered the pathways to our goals because their souls are in accord with Biafra. Read also:EU WITHOUT UK; WHAT DOES IT MEAN TO IPOB?...VICTORY IS CLOSE AND BIAFRAN FLAG MUST BE RAISED UP! It is a shame that Britain can encourage and indulge in any form of democratic voting while she has automatically broken protocols in creating a fake nation by enforcement and till date encouraged suppression of powers and fundamental rights, and oppression of the opposition by the people solely for her benefit in a foreign land, not even Europe but here in West Africa, ditto, it is over! Biafrexit has replaced Brexit and that is our reality. With the going of Britain from European Union, so will Biafrans majestically march out of Britain's Nigeria and if Britain has any decorum left, she has to restitute and undo her erotically made Nigeria. Now, there is light in Biafra's tunnel and Buhari must look forward to seeing the approach of the rising sun or be scorched by her in due course. What else can he do to us, eh? He has abducted our leader and jailed him unconditionally without trial. He has murdered our kit and kin in hundreds during peaceful protests, praying sessions, Heroes day, etc. Many Biafrans have been abducted, arrested, gone missing till date, incarcerated, and locked behind bars for demanding for their rights. Yet, in all these, we are resolute. The more they kill one of us, all of us come out stronger and bolder. This is the Biafran spirit. We are seeds planted by the Almighty and arranged by the rivers of life in a land full of milk and honey. We are set to go and any PHARAOH that tries to stop her will perish without a trace. Britain and Buhari must borrow a leaf from Balak and Balaam. Even Balaam's horse condemned his action and he confessed, NO ONE CAN CURSE WHOM GOD HAS BLESSED. Biafra is blessed, she is the apple of God's eye. We are unstoppable, insurmountable and indestructible. Buhari it is time to let Biafra go. Everyday is for the thief but one day is for the owner. We demand for our land and no one will take our inheritance and heritage away. Ahab and Jezebel did same to Naboth by killing him and taking his only heritage, just like Biafra is being milked without our consent and to our detrimento, lacking dividends, Ahab paid dearly for it. Same fate awaits any modern Ahab, for God does not change, neither is he a man to lie and definitely, no respecter of persons or personality. Sing it! Tweet it! Announce her! Spread the campaign brethren, as we enter the last phase of our race. This is not a joke, Buhari, be not decieved, BIAFREXIT is no different from BREXIT, let Biafra go!